Let love be your resolution. If only I could put in mine to not see schmaltzy, unfunny romantic comedies, then that’d be awesome. 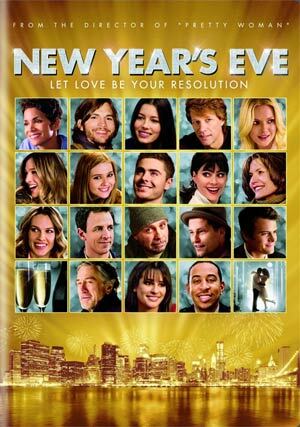 Sadly, Garry Marshall’s holiday follow-up from 2010’s Valentine’s Day (at best an average flick), New Year’s Eve is absolutely awful, holding no charm and doesn’t even try linking the variety of bland characters…or at least does it in the laziest fashion. One story follows the adventures of bicycle courier, and all around pretty boy, Paul (ZAC EFRON) as he takes the older Ingrid (MICHELLE PFEIFFER) around New York City to mark off her 2011 resolutions list, the first one she took care of by quitting her job from her obnoxious boss (JOHN LITHGOW in an uncredited cameo). Randy (ASHTON KUTCHER playing a different character from VD) hates New Year’s and all that it brings but he gets stuck in an elevator with the lovely Elise (LEA MICHELE) for hours. Griffin (SETH MEYERS) and Tess (JESSICA BIEL) are expecting their first child and compete with James (TIL SCHWEIGER) and Grace (SARAH PAULSON) to receive the $25,000 reward for having the first baby of the year. Laura (KATHERINE HEIGL) is a cook preparing for the biggest party of the night headlined by former flame, and star singer, Jensen (JON BON JOVI) who proposed marriage but sprinted away at the last minute a year before. Kim (SARAH JESSICA PARKER) is a divorced mother trying to deal with her teenage daughter (ABIGAIL BRESLIN), a straight arrow who wants to spend New Year’s with her school crush. Stan Harris (ROBERT DE NIRO) is a dying man refusing treatment and wants to spend his last hours watching the ball drop from the hospital roof, which his doctor (CARY ELWES) can’t allow, but in the meantime, receives comfort from Nurse Aimee (HALLE BERRY). Sam (JOSH DUHAMEL) is a successful executive who needs to get to NYC for a big speech and to possibly meet the woman of his dreams he had met the year before, never getting her name and only a message to meet her there at the same spot at midnight. Finally, and probably the more central storyline if there was one, follows Claire (HILARY SWANK) on her debut as the executive in charge of the ball drop, receiving support from a NYPD officer (CHRIS “LUDACRIS” BRIDGES). Sure, I could’ve spiced that summary up, but why set you up for disappointment considering how dull and uninspiring each one of them is. The other problem, aside from the story issues, is the filmmakers’ didn’t even make an attempt to creatively bring some of these characters together and instead have more or less a tether stringing them. For instance, it’s established early on that Paul (Efron) and Randy are best friends but this is merely done via phone conversations. Another one, we find out Paul is in fact the younger brother of one of the other characters (got to keep something in this movie a surprise). This is a problem because one of the few things that make these ensemble movies run is seeing how they are connected to one another; hell, I think Valentine’s Day did a better job at, comparatively speaking of course. But even setting that aside, this is a downright dull and boring movie. For romance it’s not exactly schmaltzy enough, for a drama it’s melodramatic given we’ve got a man on his deathbed (perhaps symbolic for De Niro’s career) and as a comedy, there’s not one damn thing funny or even charming. Give me something or somebody to like, somebody whom I care about their circumstances. I suppose Halle Berry’s character has some of that as she talks with her husband (played by Common, losing even more credibility in his brief appearance) over the Internet as he’s serving overseas. As far as the direction is concerned, I have to ask what happened to Garry Marshall. Obviously he never was a great director, he has helmed a few good flicks in the past including Pretty Woman, Nothing in Common, Overboard and even tearjerker, Beaches and yet he also has Exit to Eden, Georgia Rule and Valentine’s Day on his resume. New Year’s Eve is easily his worst film to date, offering little value beyond nice looking cinematography and travelogue of New York City. It’s not enough to bring together some famous/beautiful actors together but you have to also have characters and a story the audience give a hoot about. The trailers might’ve made this look like an acceptable romantic comedy but instead little about it really works. If you value your time (it clocks in at nearly two hours), please skip New Year’s Eve. Feature Commentary – Producer/Director Garry Marshall delivers a dry but sometimes humorous commentary offering up tidbits about filming and working with the different cast members. I kind of prefer if he had someone else, say one of the 100 cast members, join him but for a solo track, it’s not bad, but nothing great either. Gag Reel (11:04) – You’ll quickly find out that Garry Marshall loves gag reels and he tells you so in an introduction. Nothing special but at least it looks like the actors are having a good time; also, some of these can be seen during the end credits. The release also includes an UltraViolet Digital Copy for streaming across the Internet. New Year’s Eve arrives, fashionably late, on DVD with an OK looking standard def transfer. The movie is presented with in 1.78 anamorphic widescreen (originally 1.85) and outside of some of the usual pixilation, it’s not too bad. The Dolby Digital 5.1 track is suitable enough providing a wide range from the quieter dialogue-driven scenes to some of the more dynamic moments such as the musical numbers or generic soundtrack/score. 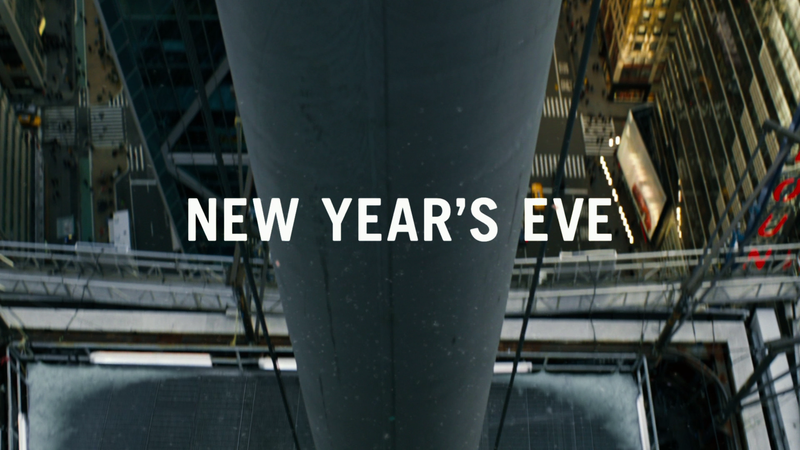 Overall, New Year’s Eve is an all around poorly made movie. The writing is lazy, the interconnecting tissue between the ensemble is at best thin and just the overall plot never really had the proper flow; even Valentine’s Day seemed to have a more cohesive story. Simply put, I hated, hated, HATED this movie and the only redeeming factor (and trust me, it’s thin), is that the cinematography looks good and it’s not nearly as awful compared with the other dreck I’ve seen in 2011. Not much of an endorsement, it’s still something.